I am at home today, sick with a sore throat and headache! blech. On the bright side, at least I will get my blogging in a little bit earlier today. 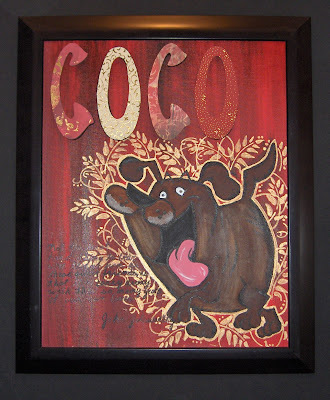 This was an acrylic painting I did a couple years ago, when my beloved chocolate lab died. I loved her with all my heart, and she truly was my best friend. We got her when I was nine and she died 13 years later on my birthday. Even after all this time, I miss her like crazy. You can never underestimate the power of a relationship and bond between humans and animals. The quote says: "Not the least hard thing to bear when they go from us, these quiet friends, is that they carry away with them so many years of our own lives." John Galsworthy This was her towards her last days, but she was a fat, jovial dog that I will forever remember as my best friend and companion! What a sweet way to remember your beloved friend. luv the painting and the pic! what a precious dog!